I truly don't understand the joseki move and would never even consider playing such a move in a game. The only move I would consider is playing above and continue the pushing battle. In fact, in my games, I do not know when to stop pushing, and end up getting horrible positions, that is, as White here, with Black getting a terrific a wall by continuing pushing on the 4th line. My opponents of the same or weaker strength seem to have the same level of awareness, since they play where I would. The question is: how does White counter Black pushing on the 4th line? Andy: black is giving territory for influence. since it's white's sente a wedge move to counter black's plan at a or b seems appropriate. Personally, I'd prefer the high wedge at a to keep black from developing a dominating center. White's stones at the bottom are secure enough for now since there is aji on both sides for black. Black's move at seals white in without giving white the option to complicate with a DoubleHane. 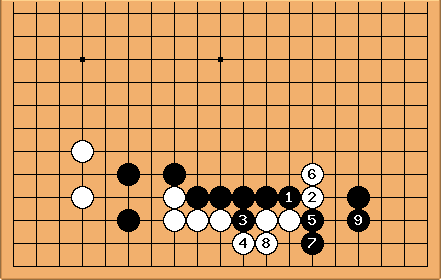 White's territorial gain on the 3rd line is not really enough to compensate for the power of an enormous black wall on the fourth line as you mention, particularly if black gets in a SanRenSei move on the right, so stop pushing as soon as your group is secure. Just my $0.02. Mef: To me it looks like continuing to push is "punishment" enough, since after black is pushing from behind. Calvin:  This variation is covered in some detail in A Dictionary of Modern Fuseki, The Korean Style. Without giving too much away, it's important to observe that if white plays tenuki after , black has good follow-ups at c and d. Also, it says d is the best move for white. So it's a key move for both players. I've got my own interpretation that is not from the book. If white tenukis, for black to play at c is sente. (White will get a bad result if she ignores it.) If you do the straight push described later, you can't connect at at c in sente any more (am I right? ), so to push immediately removes white's weaknesses and is a bit aji keshi. Velobici: Is the initial sequence (the original diagram) correct? Per Essential Joseki, this sequence beginning with the stone is not joseki. White gets profit on both the left side and the bottom, while Black's "thickness is nothing to rave about" (p 164). 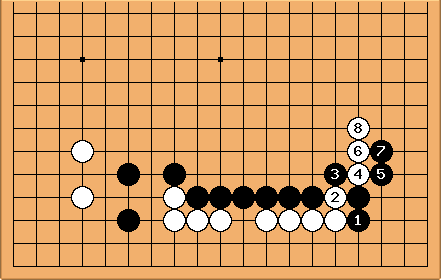 Secondly, White should extend to before playing (the sequence in the diagram is reversed), lest Black descend after by playing at the point of (page 12). There is also the White kick at e and response at f which should be played immediately before . Dieter: Let's see why in this case the conventional wisdom that pushing from behind is bad would apply. At least the presence of the marked stone could counter the proverb. If Black pushes until his friendly stone is reached (a is more severe than ), White has built enough eyespace at the bottom to be safe. Black's wall is nullified by . ilan: Thanks Dieter! In fact, this is pretty much what happened in my game, where I was White. Maybe my problem is that I have no understanding of thickness and how to deal with it (from either side). dnerra: I think this result is good for Black. Black has a wall without a single flaw, and is almost too close to this thickness. I think has to be at to prevent this. If Black plays , his marked stone is cut off severely and Black's thickness is no more. is the way to get ahead. If White now nullifies Black's influence with , Black can go for thickness at the bottom with . dnerra: is pretty much sente, W should reply at a. Otherwise, Black b is too big. This means that probably should be at . 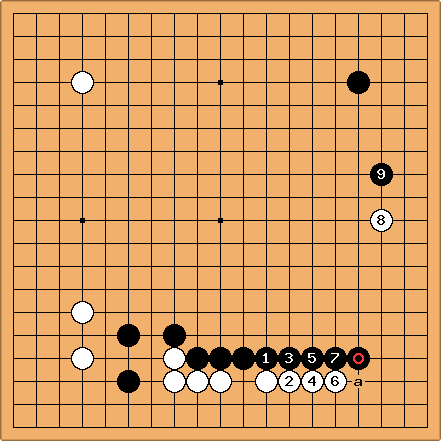 Bill: Jiang and Rui discuss this position in 世界の新定石 Part 1 (New Joseki Around the World, part 1). Bill: They consider an overplay, and give this response for White. Bill: Then - , biting off , is big. If then , . Bill: They give this sequence as the usual one. shores up Black's weakness and prevents a large sente with . Then attacks, utilizing Black's thickness. I do not really know what to make of this fighting variation. dnerra: As hinted above, I personally think that is out of the question, as at gives an excellent result, and it is unbearable to have so many shape defects as Black does in this diagram. Perhaps this is already enough for White. dnerra: I think this is how I would play as W.
ilan: I understand this a little better. This fighting sequence looks difficult for White. tderz: dia. :I have recently seen this move as response, instead of the standard white a. I do not understand it very well. What are the pros and cons? Comment  by Calvin has been added, thanks. I will check out this book. dnerra: I don't like it, because there remains a weakness at b.
Alex Weldon: dnerra is stronger than me, so maybe it really is bad, but personally, I would consider playing it here. a is more normal, as you say, but has more effect on the corner and it seems to me that Black is just as thin as White. Furthermore, White has evasion tactics like c and d, should things get sticky. dnerra: First, it's not a bad move, it appears in pro games. So you are free to like it, of course. But there are some problems. What do you want to reply to Black b? If you reply at a, then your claim that has more effect on the corner has already be proven wrong: Black can play e, threating to cut below , and so White has to reply at f in my opinion. The main advantage of W0 is the bigger effect it has on the large keima connection from to the hoshi. Alex Weldon: Excellent points, but won't Black be hesitant to play a, b, e, f (corr. : you mean b-a-e-f; (tderz)) because it weakens the large knight connection even further? I guess it was inaccurate to say that has more effect on the corner, but I was never claiming that a wasn't a serious weakness, only that Black is thin too. Maybe White doesn't even need to play f at once, if he can counterattack at g in response to e.
dnerra: Of course this sequence has 2 sides. I don't think W can afforc to counterattack, though, the damage of the cut on the lower central group is too big (i.e. either the cut is sente, or W has to weaken it's corner while trying to live). Anyway, as White I prefer not to leave possibilities like this around. tderz: dia. :Black thinks of. But actually, the weakness at e could poss. be exploited later, once the left white group is totally safe. Also the aji g is now stronger for White than before . seems premature, not enough prepared. Last but not least, directly Be fails due to in dia . Alex, I think dnerra means that Black e here or in dia. threatens the sequence which fails in dia. and is stronger. tderz: dia. : + are not possible if Black e (dia.) was here. should be better at a to avoid a positive sequence by black (detected by anonymous). dnerra Yes, this does not work without preparation. tderz:dia. : With the 6 black liberties on the right, Black won't win a semeai against the white group on the left. Furthermore, White has moves c or d at her disposal. (Anonymous): So how will white play if black at a? tderz: its White's moveafter in dia 14. 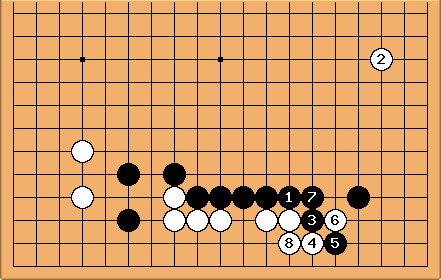 If Black plays __a_ after = in dia 15], White simply captures. tderz: 6 in a row are usually technically dead even with sente thus leaves White the possibility to capture Black in 5 moves, starting with Wb. However, I totally overlooked that B, gets playing at a in sente because W must defend at i. Therewith Black can live with b. Thank you for your comment/correction! tderz:dia. : Consequence of threat a of anonymous = is thus, that in dia  should be at a there. to just shown as the normal liberty increasing tactics which would not lead to anything here (because B has ). Playing like this would be aji keshi by B. But white wouldn't play like this in the first place). tderz: dia. : ... tries to link under, but eventually, White is shut in. Escapes with W h or i (sometimes tesuji) do not seem possible. Alex Weldon: Yes, I understood all of this, but thank you for the diagrams, since they'll be helpful for others and I was too lazy to create them. There's still one thing confusing me, though. When I read dnerra's initial comments, this is what I understood: Black probes with to make sure to get in response, then forces with . One often sees sacrificial peeps like this if reversing the move order might allow the opponent to defend differently. Now I'm wondering if what was meant was that forces because of the potential of - that is, if , White must , regardless of whether / was already exchanged. That makes a big difference, since has a lot of effect on the outside. So, if Black plays without the / exchange, can White resist with a? Having established a way out for her stone on the right, she might then be able to answer by blocking at b. If B then came out at , W c would start looking interesting. Dieter: Taking up dnerra's suggestion, would this and be better? Black has a as aji. is one point further away (though Black's wall has come closer as well). The invasion at b remains valid, and is further away from this invasion as well. dnerra: Yes, I personally think this is better than playing at .